This site is devoted to fostering practical and creative dialog for promoting excellence in K-12 Christian schools. Summer is a great time for a school leader. While we may not have the "summer off" the slower pace of the summer months allow time for the 3Rs that are essential practices of a leader: Resting, Reflecting, and Refocusing. Are you the Master or the slave of your smartphone? Before you dismiss this question too quickly take a few moments to watch this short video: I Forgot My Phone. It is not the purpose of this article to make you feel guilty. The purpose is to help you become the master of your phone rather than its slave. Like overcoming any addiction or enslavement, the first step is to admit that you have a problem. You have to admit that you are shackled to that beeping, buzzing, blinking omnipresent electronic device. Meetings are powerful. Good meetings can forge good relationships, clarify objectives, solve problems, and spur innovation. Bad meetings are terrible; they frustrate those in attendance, sap energy and enthusiasm, and waste precious time and money. Few people look forward to meetings because most meetings are unproductive and unpleasant. Meetings can be both effective and enjoyable. Here are simple tips to reduce the number of meetings you have and to improve those you do have. Begin the meeting with genuine prayer, not a pro forma exercise in religiosity. Remember, “the heart of man plans his way, but the Lord establishes his steps.” Since this is true, ask The Lord to grant you wisdom and providential guidance in your deliberations and decisions. Don’t meet just because it is on the schedule. Generally, regularly scheduled meetings are a bad idea. For meetings to be useful for all in attendance, they need to be necessary. Prior to scheduling the meeting ask: “Does this topic/issue require a sit down meeting or could you simply call, drop by an office or two, have a standup meeting, or handle the topic/issue by email?” I have made a practice of prescheduling an Executive Team meeting each month to protect the time on the calendar should the meeting be necessary. However, I cancel the meeting unless there is a need to meet as indicated below. Clarify why you are scheduling the meeting. Knowing the objective (e.g. to review a policy issue, clarify objectives, etc.) is essential but not sufficient. You need to be clear why the objective is valuable and worth the time for a sit down meeting. This is the meeting’s intent. Without a powerful intent you can run an efficient meeting but end up with ineffective or minimum out comes. Pre-scheduled faculty meetings often suffer from an ill defined intent and usually end up being both inefficient and ineffective at moving the school forward. Are the right people in the meeting? Don’t frustrate people by having them in meetings unless their presence is vital. Keep in mind that having people in a meeting merely to “get information” is probably not a good use of their time. Information can be provided in a memo or an email. However, where interaction and in-depth explanations are needed, a meeting may be appropriate. Keep in mind that if the meeting is for the purpose of making a decision, make sure that only decision makers are present and prepared to make an informed decision. Don’t make the mistake of having, what David Pearl calls, “meeting tourists” present. Don’t try to do everything yourself. It is best to have senior leadership delegate the role of meeting leader to another team member and to assign someone the responsibility to take detailed notes. Senior leaders should focus on asking good questions, listening, and providing top level input. Encourage everyone’s involvement, especially your wise introverts. Extroverts will speak up but many quieter souls will not. It is often those who are “quick to hear but slow to speak” who have the best insights. Engage them in the discussion and decision making. You can have fewer but more productive meetings. Remember to have a clear focus and intent, to have only the right people in the meetings, and consider alternatives to the traditional sit down meeting. Never meet just because it is on the calendar. Purpose and need, not the calendar, should determine whether a meeting is called. –Make a seating chart. Students love the bright colors and teachers can change a student’s seat simply by moving a sticky note. –Keep notes about students’ progress and stick them in a grade book for easy reference during parent/teacher meetings and end-of-the-semester grading. –Create a colorful classroom calendar to announce daily activities, school events, and project due dates. Calendars can be easily rearranged using sticky notes. –Students love sticky notes, so let students use them to write questions and comments and stick them on a special community board. We love sticky notes because they are colorful, portable, and can accommodate almost any activity, so it is exciting to learn that technology has caught up with the easiness and practicality of the sticky note. With a school management system, teachers can accomplish the same tasks as with sticky notes, only better. School management software provides a way for teachers to write, organize, and access their notes electronically. Notes can be entered and accessed anywhere, anytime. It eliminates the need for clunky grade books which can be a challenge to keep organized (and can have a bunch of sticky notes hanging out of them). The classroom forum feature enables students to ask questions and share ideas with the teacher and the class outside of the classroom. The forum can also be used as a fun way to engage students in a classroom conversation or debate using the texting technology that they love. And school management software not only helps teachers, but it helps parents and students, too. They have access to the classroom calendar, assignments, projects, grades, and attendance right from their home computer. Another tremendous benefit of school management software over sticky notes is that it is always available. Teachers don’t have to wait to get back to their classrooms, students don’t have to wait to get help, and parents can keep track of their student’s assignments and progress on a daily basis. Sticky notes will always be used in the classroom in colorful displays and as fun bulletin boards. But when it comes to classroom organization, accessibility, and communication, then school management software is the best tool to help schools, teachers, and students succeed. For more information about how QuickSchools school management software can help your school, visit QuickSchools.com. This article has been adapted from an article of the same name posted on About.Com: Grammar and Composition. How you communicate is essential for your effectiveness and leadership. Spending a few minutes reflecting on how to improve your communications can enhance your leadership and help you achieve the results you are seeking. It is time to renew your faculty/staff parking decals. New decals are required by Nov. 1. Parking Rules and Regulations require that all vehicles driven on campus must display the current decal. Please renew your faculty/staff parking decals by November 1. Of course, if the author of the email had been keeping his readers in mind, he might have included another useful tidbit: a clue as to how and where to renew the decals. 1. Always fill in the subject line with a descriptive topic that means something to your reader: Not “Decals” or “Important!” but “Deadline for New Parking Decals.” Keep it short and descriptive. Taking time to write a good subject line has two advantages: 1) It helps the recipient know why the email is important and should be read and 2) It will help you and the recipient find the email later if needed. Never leave the subject line blank. 2. Do not “hijack” an email. Hijacking is starting a new subject in an existing email conversation. This is confusing and makes finding the needed email later much more difficult. 3. Put your main point in the opening sentence. Most readers won’t stick around for a surprise ending. Get to the point immediately. 4. Never begin a message with a vague “This”–as in “This needs to be done by 5:00.” Always specify what you’re writing about. 5. Don’t use ALL CAPITALS (no shouting! ), or all lower-case letters either. Using ALL CAPS is hard to read and comes across as rude and unprofessional. 6. As a general rule, PLZ avoid “textspeak” (abbreviations and acronyms): you may be ROFLOL (rolling on the floor laughing out loud), but your reader may be left wondering WUWT (what’s up with that). 7. Be brief. If your message runs longer than two or three short paragraphs, consider (a) reducing the message, (b) providing an attachment, or (c) picking up the phone and calling. 8. Limit the number of recipients for your emails. To combat the wasted time associated with emails send and/or copied to too many employees, Ferrari just implemented a new policy putting the brakes on staff emails. The luxury car manufacturer said it was targeting time wasting and inefficiency by limiting the number of people staff can send emails to. From now on, each Ferrari employee would only be able to send the same email to three people in-house, Ferrari said in a statement. "Ferrari's employees will be talking to their colleagues more from today forward," Ferrari said. "To incentivise more efficient and direct communication within the company, the decision has been made to place much stricter limits on the number of emails being sent.'' … The injudicious sending of emails with dozens of recipients often on subjects with no relevance to most of the latter is one of the main causes of time wastage and inefficiency in the average working day in business,'' Ferrari said. "Ferrari has therefore decided to nip the problem in the bud by issuing a very clear and simple instruction to its employees: talk to each other more and write less." 9. Remember to say “please” and “thank you.” Always be courteous, friendly, and professional. 10. Add a signature block with appropriate contact information (in most cases, your name, business address, and phone number. Do you need to clutter the signature block with a clever quotation and artwork? Probably not. 11. Edit and proofread before hitting “send.” You may think you’re too busy to sweat the small stuff, but unfortunately your reader may think you’re a careless dolt. 12. Finally, reply promptly to serious messages. If you need more than 24 hours to collect information or make a decision, send a brief response explaining the delay. Following these tips will make your communication more effective and professional. They will also enhance your leadership and be a blessing to those who receive your emails. In my previous two posts in this series (Part 1: Why I went Paperless--There Had to Be a Better Way and Part 2:How I Went Paperless: What I Use) I explained why I have gone paperless and the hardware and software that I use. In this third and final article in the series I will demonstrate how I work paperlessly. I am also including diagrams to illustrate the process for emails, paper documents, and meetings. It is one thing to have a fleet of powerful applications at your disposal. It is quite another to develop a workflow using those applications that is easy, efficient, and dependable. The process of creating such a workflow is never done but I believe I have reached the point where I spend little time managing documents, communications, and applications and more time focused on what is important—people and projects. Here, in brief, is a sample of how I have managed to create an almost frictionless, paperless workflow. This is obviously not comprehensive but I hope it provides an example of how to process all the information coming your way without paper. I do not use my email inbox to track todos and follow-ups! I ask my staff to send it to me digitally—I do not accept paper from staff. If the document is from a non-school employee, I also ask for a digital version if I deem it appropriate and polite. Create a task for myself if related to a project. After the meeting, I create projects and/or tasks for others and/or myself in OmniFocus (OF) from the action items in my notes. After creating the OF projects and/or tasks, I archive the notes in Evernote and link the notes to the tasks/projects in OmniFocus for reference. For a project involving more than one person, I create a collaborative document in Google Drive for those working on the project and link the Google document to the OmniFocus project. I wish I could tell you this will be easy. It is not. When first starting your journey to the paperless promise land you will have some mountains to climb and rivers to cross. You will initially increase your stress and reduce your productivity as you learn new programs and develop a new workflow. It takes time and consistency to master a new routine and form new habits. In short, hang in there! This is not a sprint, it is a marathon. If you find yourself struggling to manage the tsunami of information coming at you in paper and digital form, you find yourself working feverishly to juggle multiple projects and if you want to reduce stress and increase your productivity, I recommend that you consider going paperless. Give it try-going paperless will save you time, money, and stress once you master the tools and workflow. It will be worth the time and effort. At the end of a hard journey is a better place for your professional and personal life. NOTE: You can download this Appendix as a PDF here. Below is a simple table for quick reference as you explore applications in your quest for paperless productivity. These are the tools that I have settled on after much trial and error. My hope is that it will save you time and frustration. If you are a PC/Windows user, there are compatible programs--you will have to do a bit of research and experimentation to find the tools that work for you. In my previous post (Part 1: Why I went Paperless--There had to be a better way), I explained what motived me to go paperless and my specific goals. I also showed you a picture of my office. This is my computer desktop; just as neat and again, I did NOT clean it up for this article. I have one folder on my desktop with two or three active documents. How can I have such a neat office and computer desktop? Because everything is digital and in its place to reduce stress and increase productivity. Note: throughout this article you will find links to sample screen shots to illustrate how the applications are used. It was not easy to change deeply ingrained habits. For my entire life I have handled paper. Over the years I developed a workflow that, well, worked-for paper. My process was familiar and comfortable. But, my workflow was developed around paper and filing cabinets, not digital communications and mobile devices. Adding to the difficulty is the fact many people still operate in both the digital and analog worlds. I receive much unwanted paper in meetings, at conferences, and in the mail. And I receive an ever increasing avalanche of digital documents and communications. Everything was jumbled together. Projects consisted of paper documents, digital documents, emails, and websites. Meeting notes were on legal pads with followup communications in email. Finding, producing, sharing, and consolidating information from the paper and digital worlds was becoming increasingly complex and frustrating. The struggle was not convincing myself that I needed to go paperless. The struggle was finding the right combination of software and hardware and designing an easy to manage workflow that worked across platforms without unnecessary overlap and complexity. The struggle was also forcing myself to abandon old habits and create new ones. After much trial and error, I can confidently declare that I am now happily and productively paperless. I can also assert that short of an apocalypse, I will never go back to using paper. The information below is a summary of the tools I use and my workflow. I am not attempting to provide a step-by-step guide for these tools. Instead, my propose is to offer a model and way of thinking about these tools and workflow so that you can adapt them to your situation, needs, and preferences. For years I was a diehard PC and Windows user. My software and workflow revolved around the Wintel platform, including Microsoft Office. I have switched to Apple hardware and for most, not all, document production and communication I rely on cloud-based services such as Google. The reasons for the switch are explained below. But—and this is important—this series of articles are not intended to promote one platform over another; one can be equally successful in moving to a paperless workflow using the Wintel platform. It is not necessary to switch to the hardware and software applications I have listed below. There are equally, and perhaps in some cases, better services and applications from other companies. The key is understanding what is needed to go paperless so that you can choose the best combination of hardware, software, and services to meet your needs. For me, after years using Windows software, I have switched to Apple and Google hardware, software, and services. I use the following hardware: Macbook Pro Retina, iPad with a Logitech FabricSkin Bluetooth Keyboard Folio, an iPhone 5 and a Fujitsu scanner. I chose to move to Apple hardware because I became convinced that for my purposes they are more reliable and require less work to maintain. Because the hardware and software are designed by the same company they work seamlessly together. Apple support is rarely needed and is excellent in those rare instances when it is needed. Support is readily available by phone or from the local Apple store. The fact that the hardware is beautiful and pleasant to use is a bonus. I want to again emphasize, however, that for others the Wintel platform may be better. The following list is not comprehensive; it is a summary of the major applications and services I use for the majority of my work. For each application I will provide a brief reason for the selection and how it is used. Later I will share how I use the applications for my workflow. Frankly, before switching to Apple and Google products I was nervous. Being a Microsoft and PC power user, I was concerned that I would lose the power and flexibility that I needed to get my work done. I was apprehensive that I may not have access to the best software and that I would have trouble integrating my workflow with colleagues and friends who were on the Wintel platform. My fears proved to be unfounded. I didn’t lose anything—in fact, I gained a great deal. Whereas on the PC/Wintel platform I was restricted to Microsoft, Windows-based, and Google products, on the Apple platform I had access to every application made for all three platforms: Microsoft Office for the Mac, Apple’s iWorks and iLife application suites, and Google’s applications and services. I also had access to any Windows-based software I needed to run by running Virtual Box or Parallels on my Mac. In other words, I have the best of all worlds. What surprised me the most is that I found myself not needing or wanting to use Microsoft products (except for the occasional complex Excel spreadsheet) or other Windows-based applications. I have found wonderful, and often superior, substitutes for everything I used on my PC. I have nothing against Microsoft. They sell arguably the most feature rich professional office software on the planet. If your work requires the production of complex spreadsheets and text documents, you cannot beat MS Office. I found, however, that for 95% of my work, I did not need the complex or advanced features. For those few (and they become rarer by the week) projects that require advanced features, I can fire up MS Office for the Mac and do whatever I need to do. Google offers a full suite of products and services. You can find a comprehensive list here. Google’s applications provide the basic features most people need but they lack some advanced features. There are several advantages of using Google Apps (note: Microsoft’s Office 365 suite and SkyDrive offer similar features but I have found their collaboration capabilities to be less capable than Google’s). The apps are free or very low cost, they are always up-to-date, you do not have the overhead of maintaining and supporting the software, and most importantly for workflow, you can collaborate and share documents without the need to constantly send attachments in emails, although you can if you desire. For a good comparison between Google Apps. versus Office 365 click here. The author is a bit biased toward MS but it is a good comparison. I use Google Apps (Documents and Spreadsheets) for creating basic documents, collaboration, and sharing. I also use them when I need to collaborate with people outside of the school. Google applications are my no frills, workhorse applications. I use the Apple’s Pages application when I want to produce a slick, professional looking document or newsletter to send to others. I also use Apple Pages for all text-based presentations that I give. By saving the presentation as a Pages document in iCloud, I can easily access it on my iPad for my many speaking engagements. iCloud keeps both versions in sync. I may draft the document in Google Docs or ByWord on my Mac (for example, I wrote the draft of this article using ByWord: more on the reason for this below) and then pasted the content into Pages for polishing. I use the Drafts application when taking meeting notes on the iPad. I use Numbers when I want to produce a basic but well designed spreadsheet with visually informative and appealing charts. Numbers is a good application but lacks many of the advanced features found in Excel. Surprisingly, I no longer ever need or desire to use MS Word. I can open any Word document I receive in an email in Pages or Google Docs. I find MS Word to be a feature rich but bloated with a complex and distracting interface. Excel is unquestionably the most capable spreadsheet program you can buy. I use Excel when I receive an Excel spreadsheet from others. I also use it when I need to produce or work with a complex spreadsheet. There are times when there is no substitute for Excel. In those instances I fire up Excel for the Mac. Modern word processors can be distracting because they tempt one to fiddle with formatting the text. This creates distraction when you need to focus on your words--and just your words. This is why I use ByWord. It is a beautifully designed minimalist application that does two things extremely well: it enables you to write free of distraction and it syncs with your other products through iCloud and/or Dropbox. Click here for a screen shot of a draft I created for a blog article. I have ByWord on my Mac, my iPad, and my iPhone. I can immediately begin work on a draft document whenever I have a few undistracted minutes, e.g., on the plane. Because it is minimalist in design, it also uses less battery power enabling me to work longer when I don’t have access to a power outlet. Once the draft is finished in ByWord, I export it as an RTF or HTML file to Google or Pages for finishing. It can also be exported as a Word or PDF document. Keynote is a fantastic application for producing compelling, fresh presentations. It is powerful and feature packed but easy to learn and use. Because it uses iCloud to sync seamlessly with the Mac and other iOS devices, I can produce a beautiful presentation and then use my iPad for the presentation. This is perfect for traveling to conferences. I produce the presentation on my Mac (you can also produce them on the iPad but the iPad version is a bit more limited), sync it to iCloud, and leave the laptop at home. At the conference, I connect my iPad to a projector and use my iPhone as the remote. Simple, light, and fast. And, if I make revisions to the presentation en route to the conference and make additional revisions after the presentation, all of the changes are synced to iCloud. When I open my Mac, the revised presentation is ready for me. This same process works with Pages and Numbers. Keynote also syncs seamlessly with iPhoto and iMovie. Consequently, you have a simple and consistent way to add beautiful photos and compelling videos to your presentations and everything is always in sync and available across all of your devices. Google Drive does three things extremely well: It is the access point for all of your Google applications and documents, it archives and saves your documents automatically, and it is the platform for collaborating on and sharing your documents. Google Drive also enables you to create, edit and save documents offline (using Google’s Chrome browser) so that you do not need an Internet connection to get work done. Once you are back online, Google Drive automatically saves and syncs your documents. Evernote serves a very specific and useful purpose. It is my primary repository for document archiving, retrieval, and sharing when I do not need to work on them. The distinction between Google Drive and Evernote is important. While there is overlap, e.g., both programs save, archive and sync your documents and information, Google Drive is best for “living, active” documents. Evernote is best for static reference material. For example, any work related document that is being worked on, or that ever may need to be worked on by others, is in Google Drive. Letters, policy manuals, spreadsheets, schedules, etc., fall in this category and are on Google Drive. Receipts, research articles, articles from the internet, User Manuals, and any other static document that is used for reference are in Evernote. I also store important personal documents in Evernote, e.g., insurance papers. That way, if there is a fire I still have access the critical documents. Although I could store these in Google Drive, Evernote is better at quickly capturing information from the web on your laptop or mobile device. It is ideal for quickly searching to find just what you need. If you have a Business Account with Evernote, you can also create a Business Library of reference material for employees, e.g., Technical How-To articles from the IT department, Employee Manuals, etc. I average over 1,200 business emails each month (not counting personal emails). I also receive many phone calls and text messages. Efficiently managing and curating this flow of information requires the nimbleness of a ninja and the discipline of an Olympic athlete. It also requires the right tools. I have tried just about everything available. I spent years on Outlook (including SharePoint) and was very comfortable with the program. It is powerful and designed for the enterprise. For the same reasons I have stated above, I decided that it was time for a change. As a school, we no longer wanted to be in the email and server business. We wanted our IT staff to focus on supporting technology integration in the classroom, not on managing email, SharePoint, servers, and antivirus software. With our move to Google products, we also adopted Gmail, Google Calendar, Google Hangouts (for video-conferencing), Google+ (which we use for business related social media interaction), and a host of other applications that are integrated and cloud-based. As a consequences, we spend far less time (and money) managing email and calendars and we are able to integrate document creation and sharing with all of our digital communications. This enhances productivity, saves money and gives us capabilities that would otherwise be too complex and time consuming to manage. I have vacillated between using Gmail and Google Calendar in the browser (Safari and Chrome) or using Apple’s Mail and Calendar applications (or 3rd party applications). After experimenting with many options, I have settled on Apple’s Mail for email and BusyCal for my Calendar application. While there are advantages to using the browser version of Google products, the overall hardware and application integration on the Mac and iOS devices is better when using Apple’s applications or well designed third-party applications like BusyCal. I have also found, after spending time to master it, that Apple’s Mail program is very powerful making it easy to process an overflowing inbox quickly. BusyCal is beautifully designed and powerful. It has a built in to-do system and a menu icon that drops your calendar into view as needed and then retracts it when you are finished. This saves valuable screen space and is one less window to manage. For meetings and collaboration that do not require a face-to-face meeting but do require live communication rather than a torrent of emails, I use Google’s powerful Hangouts video-conferencing application. You can conduct a simultaneous video call with 10 people and share Google documents and/or your desktop during the call. It is a powerful program and is free. There is also an iOS application for Google Hangouts enabling you to place video calls from your iPhone or iPad when traveling. Going paperless works great for handling phone calls. My administrative assistant takes messages in a shared Google document titled “Dr. Mosbacker’s Messages.” Each morning she opens that document and enters the date. During the day she records the messages and return phone number. This document is an open tab on my browser. When I am ready to return calls, I click on the browser tab (from my Mac, iPad, or iPhone) and have all of the information I need. I can then make notes of the call in this same document and mark the call completed when I’m finished. If I ever need to find that message, person’s name, or contact information, I can search the message document from any of my devices. No paper, everything is archived and searchable. Click here for a screen shot of my messages. I have a lot of meetings and I have to take a lot of notes. I want to do so in meetings without coming across like a geek. There are several challenges in taking digital meeting notes. If you use paper, you are not paperless so you have to retype notes you need to keep (or scan them). You can’t efficiently share paper notes, and they are not immediately connected with your other documents and communications. If you use a laptop in a professional meeting you can come across as geeky in some settings. The clacking keyboard is distracting and the screen puts a barrier between the attendees. And you are tempted to multitask (check email) rather than giving the attendees your undivided attention. I have found the iPad to be the solution. It is light, is not distracting nor especially geeky, has long battery life and provides several note taking options not typically available on the laptop. You can type your notes using the silent virtual keyboard, you can use an iPad case with built in bluetooth keyboard (my preference), or you can handwrite your notes using a stylus with a note taking application like Notability. The best method will depend on the person and circumstances. My objectives are to use as few applications a possible, produce digital notes, have them safely archived for future reference, and have an efficient way to delegate and keep up with tasks flowing from the meetings. After much experimentation and no small amount of frustration, I have found a very effective and efficient system that meets my objectives. This is far simpler then it may sound but essentially I use and application called Drafts in combination with TextExpander—this program is reason enough to use a Mac! As indicated above, I use ByWord for writing drafts of larger documents, e.g., a blog article, chapters in a book, etc. For meeting notes I use Drafts. It automatically saves your work and syncs it to your other iOS devices. It is distraction free, does not require much power, and works great on the iPad and the iPhone. When combined with TextExpender one can open Drafts and with a few quick keystrokes have TextExpander drop a meeting template into Drafts and you are ready to go. One of Drafts most compelling features is the ability to send your meeting notes with just one click to Evernote, an email, Dropbox, OmniFocus, Twitter, Facebook, as a TextMessage and a host of other applications and services too numerous to list. You can also use “Open in” to export a draft to any other app installed that supports importing text files. Click here for an illustration. You can type quietly on the iPad using the bluetooth keyboard case. 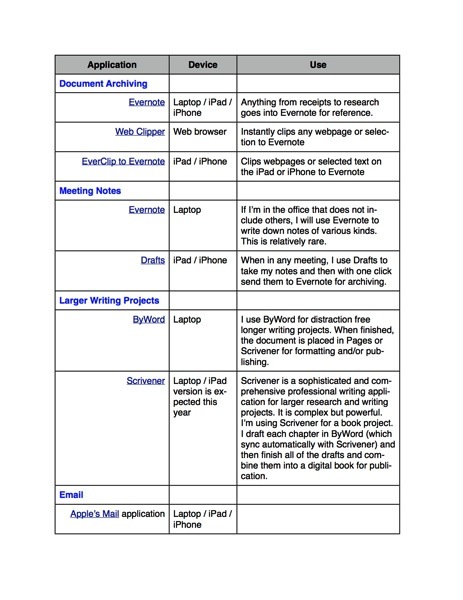 After you have completed your meeting notes, including to-do items for yourself or others, you select each item and send it to OmniFocus (more on OmniFocus below) or Evernote (my preference because then all of my meeting notes are archived in the appropriate project notebook). For example, I have an interview template in TextExpander. Prior to the start of the interview, I open my iPad, fire up the Drafts app., and open the interview template with TextExpander. When the interview starts, I discretely take my notes in Drafts using the embedded template. After the meeting is over, with one click I send the notes to Evernote for archiving. No paper. No filing. And, I can always access these notes on any device, anytime, anywhere. I can also share my interview notes with my administrative assistant or others as needed. Work on all of my devices. Be powerful and flexible without being overly complicated. Be developed and supported by a company that I trust and was confident would be around for a long time. Integrate tightly with my other major applications (Google Docs, ByWord, Drafts, Gmail, Apple Mail, BusyCal, and Evernote). Enable actions and viewing of projects, tasks, and documents by project, date, person, or context. Alert me when projects were coming due, were due, or were late. Give me the ability to create tasks or projects directly from emails, Drafts, or Evernote without copying and pasting. OmniFocus does all of this and more. The capabilities will be briefly illustrated in the next article in the series but suffice it to say that OmniFocus integrates all of the above features into one powerful yet relatively simple product. That is no small feat! Click here for a sample screen shot. In my next and final post (Part 3: Workflow--putting it all together) in this series I illustrate how I use the hardware and software to create a paperless workflow. 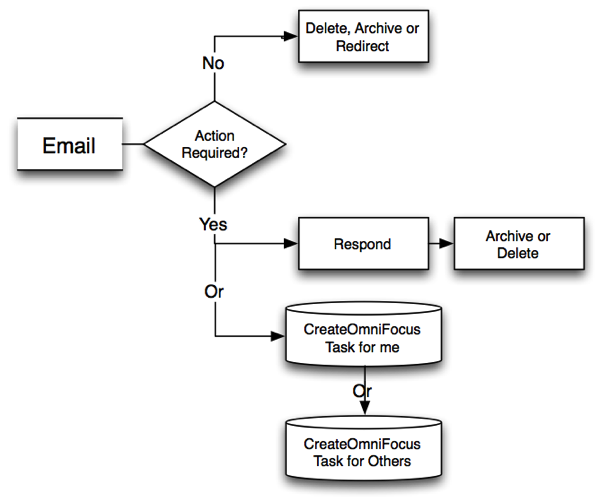 I will also provide diagrams illustrating how the workflow works for emails, paper documents, and meetings. I did not clean it up for this article. I now function without paper. I’ll never go back to paper and I believe if you give this a try you won’t either. I am sharing with you why I went paperless and how I did it with the hope that you too will discover the increased productivity and reduced stress that I have found by changing how I do things. I lead a large school on two campuses with 200 employees, nearly 2,000 students, 1,200 families, and with a multimillion dollar budget. I also have many complex projects in process simultaneously. For example, as I write this we are designing a new science and math building, preparing for a large capital campaign and continuing the rollout of our 1:1 computing program that we callLearning Unleashed. And of course there are the daily operational issues covering personnel, academics and curriculum, parent and student issues, athletics, facilities, admissions, finance, marketing, and a host of other day to day matters. Adding to the mix are my family responsibilities, teaching adult Sunday School, teaching a graduate course as an adjunct professor, conference presentations, and my personal goals such as completing a book and writing this blog. I have many balls in the air, thousands of documents, and even more emails (over 1,200 work related emails per month), phone calls, meetings, and messages to manage. I was finding it difficult to quickly locate what I needed when I needed it and even more difficult to manage the combination of paper and digital documents and communications related to projects and day-to-day matters. I knew that there had to be a way to consolidate all of this information so that I could be both more productive and less stressed. Going paperless has helped me achieve those goals. Although being more productive and less stressed were my primary goals, there were also many secondary but important goals motivating the change. Here is my list of goals that explain why I forced myself to go paperless. Increase productivity by being able to find any document or message from any device, anytime, anyplace. Have one central “inbox” for everything that I receive so that I can quickly process it. Become more efficient by speeding up my workflow. Improve the ability to collaborate with my colleagues and associates anywhere in the world. Have automatic backups of all of my documents, communications, research, and books in the event of hardware failure, fire, or natural catastrophe. Be able to take notes in my many meetings and instantly have them saved and available for retrieval and sharing as needed. Be able to easily convert meeting notes into tasks for myself or others. Manage people and projects so that nothing falls through the cracks and to ensure that I am on top of all projects. Manage my calendar and schedule so that it does not manage me. Have an archive of all documents and communications for future reference should they be needed for projects or legal matters. Reduce the cost of printing, filing, and mailing. Eliminate filing cabinets and free up space. Reduce paper to be more environmentally responsible. Have a clutter free low stress work space. In part two of this series I will explain how I went paperless and what hardware and software I use. Too much to do! Too much stress! Not enough time! More expectations! More demands! More information! More interruptions! People, meetings, calls, emails, documents, events to attend, speaking engagements, budgets, training ….. and the list goes on! In today’s world, we are constantly bombarded with information, the urgent, and ever increasing expectations. The weight upon us and the pace of our lives often leave us feeling dissatisfied, stressed,and sometimes burned-out. There must be a better way! There is! Over the years I have worked hard at working smarter. My goal is to increase effectiveness and to decrease stress. I make no claim to having arrived—I haven’t. I have learned to juggle the myriad demands paced upon my professional and personal life by developing habits and leveraging technology to help me work smarter. Below is a brief summary of how I approach my work and responsibilities. If you want more detail or have a question, simply leave a comment and I will respond with more information. I am usually in my office by 6:00-6:15 AM, sometimes earlier—depending on how often I hit “snooze” on my alarm! This enables me to beat the rush hour traffic, making me less stressed and more efficient. I’m also in a better mood for devotions. I start the day with prayer and Bible study. My devotional time is blocked and locked on my calendar. It is not always easy to begin the day with prayer and Bible study. Some days I don’t feel particularly spiritual and don’t feel like praying or reading my Bible. I am tempted to start reading and responding to email. It doesn’t matter how I feel. I pray and study my Bible anyway. My soul is almost always warmed and enlivened through prayer and Bible study (coffee also helps!) but not always. It does not matter—I pray and study anyway. God never told me to feel like praying or to feel like reading my Bible—he simply commands me to do so. After devotions, I have 30 minutes set aside to review reports, NEXT ACTION items, the day’s appointments, etc. I am able to do this easily and effectively because I use the Task function in Outlook to manage my To Do list and projects. I am able to see at a glance what is due today and for the week. When someone other than a parent or staff member stops by and asks “do you have a minute,” usually a salesperson, if I’m not in a meeting or leaving for one, I will give him or her a little time in order to give a good testimony of the gospel. However, if this is an unscheduled drop-in, I start by meeting him or her at the door. I remain standing. This significantly shortens the unplanned meeting. I will invite the unscheduled guest to sit IF I believe the issue has the potential to benefit the school and if I have time. Otherwise, the meeting will end as a standup meeting or my assistant will schedule a follow-up meeting. In other words, in so far as possible and polite, I attempt to control my time rather than having someone else control it. I also use lunch for meetings. I have to eat anyway so I might as well make it productive. Very seldom do I eat without meeting with someone. I normally leave the office at 4:00. I go home and run four miles on the treadmill while catching up on the news—I accomplish two things at once! I shower and eat and then go to any evening meetings or events that I may have. I am almost always in bed by 10:00 and up at 5:00 the next morning. Friday mornings are blocked on my calendar for project work—off campus to minimize interruptions. This is an important time each week. I am able to focus on those BIG rocks that can be crowded out by the urgent. I have the blessing of having a wonderful administrative assistant. I have instructed her to log all phone calls into Outlook’s Notes function. This provides a permanent record of every call. After returning the calls I make quick notes on each log. This ensures that I return calls in a timely fashion and I have a record of my response—which can be as easy as “Returned, Left Message, Referred, etc. Email management is a challenge—but not impossible! Rather than outline strategies for managing email in this article, I have created a PowerPoint Presentation that you may find useful. At the end of the presentation are links to short Microsoft training videos. Click HERE to download the PowerPoint Presentation. You may share the PPT with whomever you wish; I only ask that you refer them to this blog. My Think Week is one of the most important practices that I have developed over the years. As I write this, I am preparing to leave for my Think Week. I will be reading 10 books and a stack of research documents—all on my iPad. For more information on Think Week see my previous post: How To Find Time to Focus, Think, and Work. I got the idea for Think Week from articles I read about Bill Gates and his Think Week. Here are two articles that may interest you: Article 1: Bill Gates in Secret Hideaway, Article 2: Bill Gates Think Week. I strive to be as paperless as possible. To the extent that I have everything in digital form (which is almost everything) I can have my documents with me anytime and anywhere. They are also searchable and shareable. This is far more productive than keeping up with paper, legal pads, notebooks, post-it notes, etc. I make extensive use of video-conferencing. I use ooVoo-think Skype on Steroids! Video-conferencing makes phone calls far more personal, there is less temptation to “multitask” while on a phone call, and you can share your desktop and/or files while on the call. Video-conferencing also reduces the number of emails I must process. · I use the iPad for virtually all of my reading and note taking. There is a very effective and powerful note taking application called “Note Taker HD.” Used with a stylus it is as effective as a legal pad but with the advantage that all of your notes are in one location, searchable, and shareable. Docs-to-Go on my laptop and iPad. This program syncs all of my laptop documents to my iPad so that I have everything with me at all times. Docs-to-Go also enables me to read, create, and edit Microsoft documents-Word, Excel, and PowerPoint. Mindmanager with a Catalyst subscription—for project management, brainstorming, and collaboration. The program tightly integrates with Outlook and Microsoft Office products making it an extremely effective task and project management tool. The new I.E. 9 browser and Google's Chrome. They are fast, secure, full-featured, and customizable. Note Taker HD—replaces a legal pad. Logos Bible Study software—on my laptop and iPad. For in-depth Bible study. Kindle software on the laptop, iPad, and iPhone—I carry my library in my pocket. Skydrive—for online document storage, creation, and collaboration. Skydrive and MS Webapps integrate seamlessly with Microsoft Office. Twitter—for keeping up with the news. Jott—for leaving myself reminders when I’m in the car. Adobe Acrobat Pro—for PDF creation and electronic forms completion and signing. Staying fit is critical to reducing stress and being efficient and effective. Although it gets tiresome, I count calories (I use a software program called LoseIt on my iPhone) and I track my exercise using the same program. I run four miles a day six days a week (Sunday off) unless providentially hindered. I maintain my weight within the “ideal range,” for my height and age. I do NOT like running and I do not like counting calories—but—doing so makes a big difference in how well I sleep at night and how much energy I have each day. Because I do not like running, I do not sit down when I get home—not even for a minute!! I walk immediately to the closet and change into my exercise cloths and mount the treadmill. Life is hectic and our jobs are demanding. Learning to thrive rather than merely survive as a leader is a challenge. It can be done. Attention to one’s spiritual and physical health, establishing good practices and habits, and making appropriate use of technology can all, when used in combination, reduce stress while we strive to accomplish more for God’s glory. Cafés evoke feelings of warmth, conversation, community and connection. Conversations in a cafe often give birth to great ideas. This is the idea behind this site. The Christian Education Leadership Cafe is a comfortable and informative place for connecting and sharing best practices in Christian School Leadership. This site is devoted to fostering practical and creative dialog for promoting excellence in K-12 Christian schools. Discussion focuses on leadership, productivity, professional development, technology integration, personnel, dealing with stress and conflict, enrollment and marketing, and best practices for promoting and sustaining world-class quality in Christian schools.